Great Expectations begins when a boy named Pip encounters an escaped convict in a graveyard. The gripping story that emerges from there includes money from a mysterious benefactor, a bewitching and cold-hearted girl, and the shut-in Miss Havisham, forever clothed in a tattered wedding gown. It’s no wonder that so many people consider Great Expectations to be one of Charles Dickens's best works. 1. Dickens planned to write a "grotesque tragicomic” novel. 2. He wrote the novel during the most difficult period of his life. Dickens started Great Expectations in October 1860, not long after separating from Catherine, his wife of 22 years and the mother of his ten children. He’d moved into his own place and was pursuing a young actress named Ellen Ternan. On top of that, his son was running up gambling debts, his daughter married a man Dickens didn’t like, and his elderly mother was showing signs of dementia. All this was on his mind as he started to write. 3. Estella may have been based his mistress. Dickens became smitten with18-year-old Ellen Ternan when he hired her to perform in the play The Frozen Deep. While Ellen seems to have resisted Dickens's advances at first, she eventually became his mistress. Many biographers think that the beautiful and unloving character of Estella may have been Dickens’s view of his early relationship with Estella. Estella—Latin for “star”—could be a partial anagram of Ellen Ternan. 4. Miss Havisham was based on a real person. 5. Like most of his novels, Great Expectations was published in serial form. All Dickens novels were first published in serial form, meaning that the story was broken into installments and published over a period of time in a journal or newspaper. Great Expectations ran in Dickens’s journal All the Year Round from December 1860 to August 1861. It was published in book form in October—just in time for Christmas that year. 6. Bentley Drummle was based on a publisher Dickens disliked. In the novel, Estella marries snobby, cruel Bentley Drummle instead of Pip. The name is suspiciously close to the publisher Richard Bentley, whom Dickens believed cheated him out of money. Dickens worked as the editor of Bentley's Miscellany, the publication that serialized Oliver Twist—a story which, of course, was enormously successful. Dickens and Bentley argued over money for some time. Finally, Dickens bought out his contract as well as the copyright to Oliver Twist from the publisher and got literary revenge in the form of the unflattering character. 7. Dickens carefully worked out the ages of his characters. The working notes for Great Expectations show that Dickens created a timeline for the characters’ ages. Pip, Estella, and Herbert are all 23 at the climax of the novel. Magwitch is 60, Biddy is 24, Joe is 45, and Miss Havisham is a relatively youthful 56. 8. 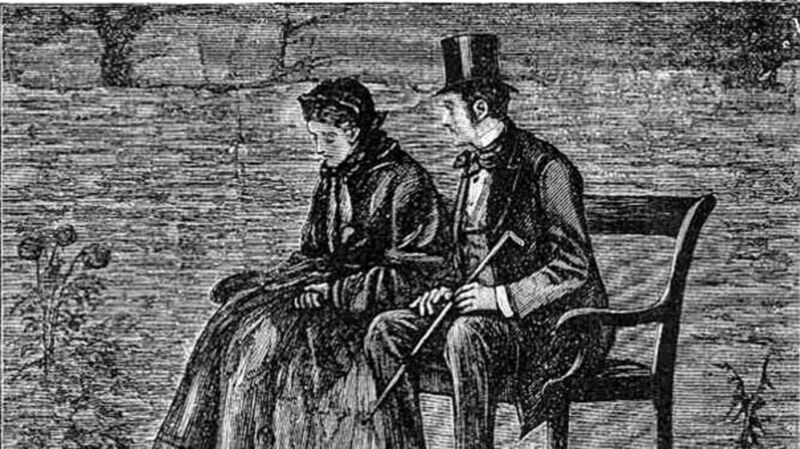 Great Expectations is one of two Dickens novels written in the first person. 9. He had Cooling Castle in mind for the graveyard scene. The memorable first section most likely took place at (or was inspired by) St James' Church in Cooling, Kent. There you can still see “Pip’s Graves,” the gravestones of 13 babies, which Dickens describes as “little stone lozenges each about a foot and a half long, which were arranged in a neat row.” Here are pictures of the church. 10. Great Expectations had an alternate ending. One day, two years after his return from the east, I was in England again—in London, and walking along Piccadilly with little Pip—when a servant came running after me to ask would I step back to a lady in a carriage who wished to speak to me. It was a little pony carriage, which the lady was driving; and the lady and I looked sadly enough on one another.